When should you ask for a sponsorship or endorsement deal? When should you ask for a sponsorship or endorsement deal? Wait What Really OK Podcast Episode 66 hosted by Brand Precision Marketing Strategist and Counselor, Loren Weisman digs in to the misconceptions and misunderstandings surrounding sponsorships and endorsements. Too many people and businesses jump the gun when they go after sponsorship or endorsement deals? It comes off like a one way situation and selfish too. Look to situations where it is mutually beneficial and what you ... Más informaciones provide for them in exposure or marketing would benefit them a great deal. Otherwise, why should they support you, if you are only looking to get support from them and not bringing much to the table? 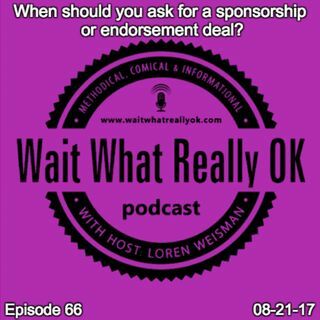 Ep 66 “When should you ask for a sponsorship or endorsement deal?” of the Wait What Really OK Podcast is available on iHeartRadio. Podcast Blog Supplement for Episode 66 of the Wait What Really OK Podcast with Loren Weisman. Podcast Link Supplement for Episode 66 of the Wait What Really OK Podcast with Loren Weisman. Why are replies such a hard task for some? Emails and responding. Podcast Video Supplement for Episode 66 of the Wait What Really OK Podcast with Loren Weisman. Podcast Photo Supplement for Episode 66 of the Wait What Really OK Podcast with Loren Weisman.